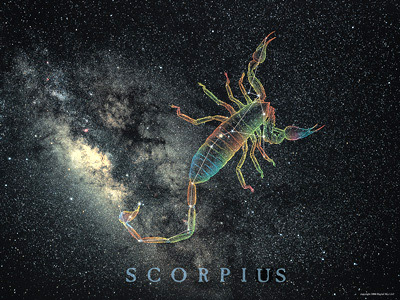 Item number DS408 - Scorpius - Image © Digital Sky LLC. Scorpius is one of the most easily recognized constellations. It has bright stars and a clearly marked outline that looks like a scorpion in the northern hemisphere. Scorpius is near the center of the Milky Way, so it is surrounded by star clouds, dark lanes, and many star clusters. There are many beautiful objects for a small telescope or binoculars. In mythology, Scorpius is associated with death and darkness. It is the creature that killed Orion, the great hunter.